Small is the new significant. 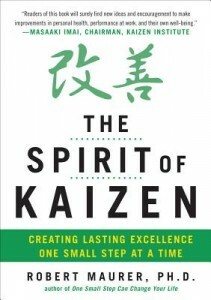 The Spirit of Kaizen is a small book by Robert Maurer that offers excellent guidance on making changes one small step at a time. This is an invaluable resource in employee engagement to counter the withering away of employee engagement because of the failure of many large scale programs and change initiatives. Back in 2009, I wrote a short review of Maurer’s other Kaizen book: The Kaizen Way: One Small Step Can Change Your Life. Full contribution. One failure of employee engagement work is the attempt to get everyone on the same page. The problem stems from not giving employees the opportunity to write on that page. As opposed to handing down the page or program Kaizen invites every member of an organization to contriubute, and the employees like the idea of being part of the solution. Small steps to skip big fears. Our brains are wired to respond to change with fear and in the process deny us access to the mental resources we need to create change. Maurer claims that small steps are like cat burglars what quietly, slowly, and softly pad past your fears. Three small steps to engagement and morale. Show appreciation, defuse difficult people, and encourage employees to take small steps toward solving their problems. It is amazing how many big scale changes are accomplished by repeatedly performing a few simple behaviors. Get the ball rolling. Maurer talked about changes made by UPS to expand into Europe. David Abney the president of UPS stated: We chalked up a little success and then built on the momentum. You don’t notice a snowball going down a hill until it grows to become the size of the stomach of a big, fat snowman. Within months, we saw small changes that eventually snowballed into a turnaround. Begin with small questions. Questions engage and small questions engage with less fear. Start your engagement by asking: What is the smallest way we could improve engagement at work. My favorite employee engagement question, seldom used is to ask employees at the end of the survey: What can you do right now to increase employee engagement right now for either yourself or another employee of our organization? Maurer holds a special regard for asking ourselves questions and not trying to answer them right away. Just keep asking and “let” the answer develop. David Zinger is a global employee engagement expert who in 2013 has worked on engagement in Delhi, Mumbai, Pune, Berlin, Prague and New York. He builds and sustains his own engagement in small 24 minute periods. He has pioneered a number of small approaches to engagement. To access Mr. Zinger’s services email him: david@davidzinger.com.